Visit the garden of cherubs! 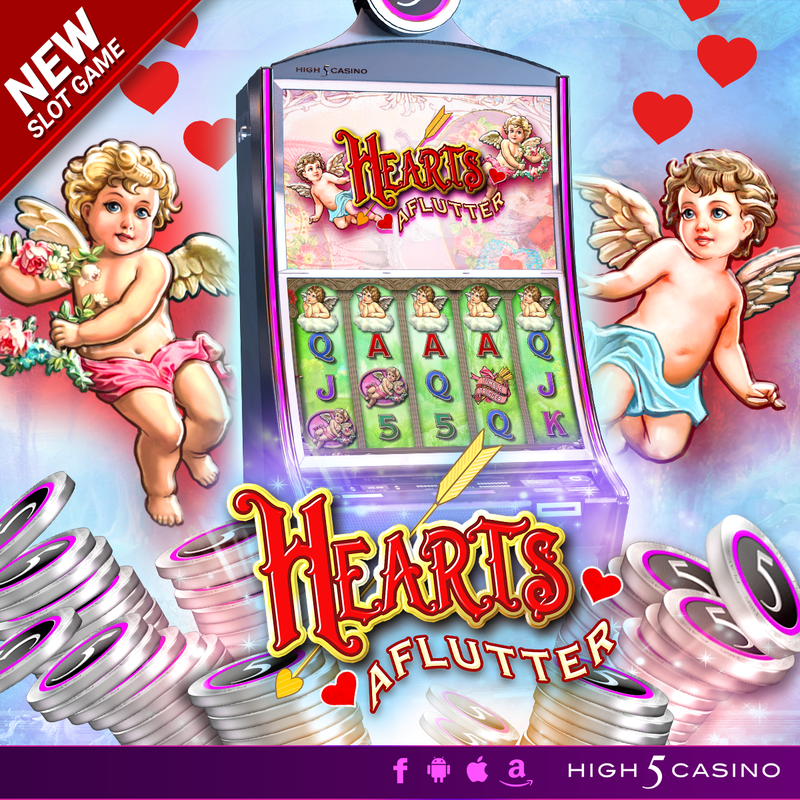 High 5 Casino’s 238th game, Hearts Aflutter arrives soon! Protectors of an enchanted garden, the playful angelic cherubs are ready to grant love and luck to those who cross their path. Sprawled across the lawn, they move like flashes of light when they see someone nearby. Visit the garden and let the sweet sounds of the harp serenade you as you hit unreal big wins. It will only be a matter of time before you fall deeply in love with Hearts Aflutter! Check the YouTube video below and get ready for the adorable cherubs to grant you love and luck! Are you ready to fall in love with Tumble Triggers? Comment in the conversation bubble located on the top right corner of your screen and let us know what you think! This entry was posted in game preview, Game Release, High 5 Casino, High 5 Games, High 5 Moments and tagged Android, Android Devices, App Store, Apple, Cherubs, Droid, Facebook, Free Games, game preview, Game Spotlight, Google Play Store, Hearts Afflutter, High 5 Casino, High 5 Casino Mobile, iOS Device, iPad, iPhone, iPod, iTunes Store, mobile gaming, slots, social gaming, tumble triggers, tumbles, Valentine's Day by hoothigh5. Bookmark the permalink. Looks good wish it would open so I can play. I have Love U at 101 and Love Letters at 140 and i am on level 234, but yet the game remains locked. Hi Owen, Please contact the Support Team via the High 5 Help Center for assistance. It can be found by clicking on the gear-shaped symbol leading you to the ‘Settings’ menu at the top right hand corner of the casino and then choose ‘Help’. You can contact our Support Team for assistance there by simply clicking on the ‘Submit A Request’ button at the top right hand corner of High 5 Help Center. Fill out the form and a customer care representative will email you as soon as possible.